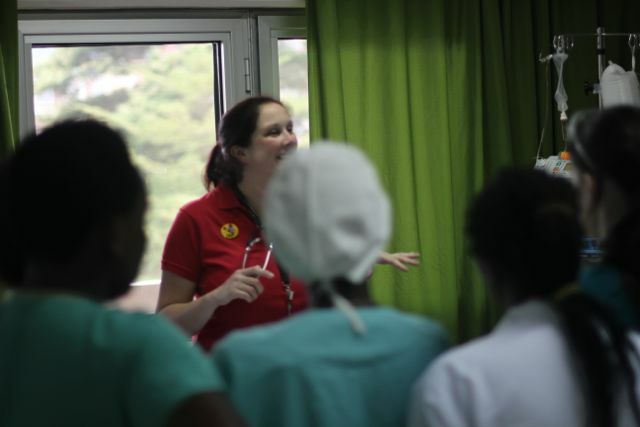 This post is by Stephanie Haven, ICU Nurse, Rwanda. Well, there has been a great deal written about what goes on in the operating theatres and on the wards, but I thought I should give you an insight into the bit in the middle. My name is Steph and I have the priviledge to work on the intensive care unit here in Rwanda. Life on the ICU here is dynamic and exciting and never ever quiet! Our job is to recieve the children immediately post-operation when they are still in that critical phase of their illness. We work hard to get them through this stage and to stabilise them ready for the ward. Our kids are attached to a whole host of equipment, ventilators to breathe for them, drugs to help their heart, pain relief, antibiotics, intravenous fluids to prevent them from getting dehydrated, pacing boxes and peritoneal dialysis. They are a mass of tubes and wires, there to help us monitor every aspect of their condition and we record their vital signs to ensure that we can pick up on those subtle but oh so critical changes in their condition. As you can imagine, the ICU is a busy place full of lights, alarms and humming machinery. It can often be quite overwhelming and scary for the families (the children are all sedated so they aren’t too bothered) and so a huge part of our job is to support those families, a job made all the more challenging by the language barrier! yet I must say the families have been wonderful, very calm, warm and friendly. In most ICU’s across the world, the patient to staff ratio is one patient to one nurse. Here in Rwanda the nurse to patient ratio is one to two, sometimes one to three. We do have great support from the local nursing team who are very welcoming, friendly, hard working and excited to learn about congenital cardiac surgery but as you can imagine our feet do not touch the ground most days. Open Heart International is always looking for additional paediatric trained ICU nurses, so if you have the skills, get volunteering people! The challenge of working with limited resources (and power outages!) must also be mentioned, we have had to DIY a great deal of our equipment (for those English people reading, Blue Peter would be proud!) and we have all become very creative! You learn to use whatever resources are available to you and it’s amazing what you can put together with a bit of tubing and a large amount of sticky tape! One day in particular I feel needs a special mention. 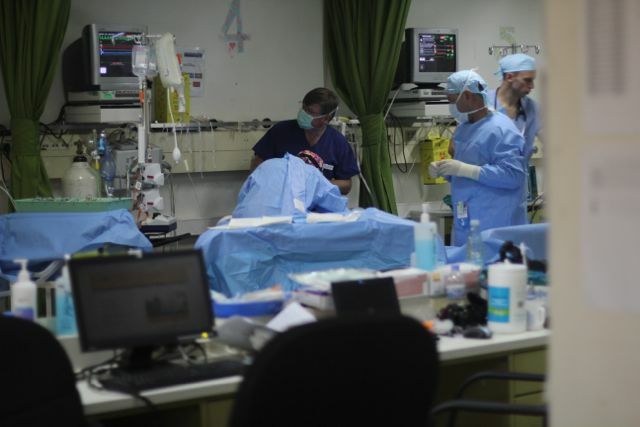 We had three patients in the ICU and were preparing to recieve two more from the operating room. The first patient returned from theatre and very quickly deteriorated due to some post operative bleeding. At the same time, one of our other children started having seizures and the baby in the very next bed had a cardiac arrest. We had three emergency situations happening at the same time and very limited staff! Despite taking every precaution, emergencies like this do happen and its not exactly uncommon. Having three though at once could be perhaps referred to as the proverbial perfect storm! Two of the children needed full resucitation and emergency procedures to open their chest’s and allow us access to their heart (both at the same time)! I will never forget the scene, two emergency chest openings at the same time, in a cramped space, limited equipment (that was all squirreled away in emergency boxes) and not even half the staff you would have at home. It was all hands on deck that day and I must say I have never seen a more incredible display of teamwork in my career. We had two surgeons work simultaneously (sitting on the beds because they were too low to stand next to and had no way to raise them), scrub nurses running between the two, anaesthetists and intensivists sedating and breathing for the patients, ICU nurses pushing in fluid, blood and drugs, the wonderful ward nurses came over to care for our other patients (we couldn’t have coped without them) and the amazing support staff running for drugs (surely we can’t have run out of adrenaline!!) and ensuring the equipment worked (Help! Please make this ventilator work!). It was really humbling to see the whole team working frantically and tirelessly, giving 110%, in very challening circumstances to save the lives of these two precious children. It takes an amazing team of really special people to do something like this. We are all very proud to see one of those children leaving the ICU and the other making small but positive steps on the road to recovery. Working in the ICU you are invited into the lives of families at the most difficult and distressing time of their lives. They put the life of their child in our hands and we invest all our time, energy and our own hearts into caring for that child. It is an honour and a priviledge and I’m so lucky to be a part of it!